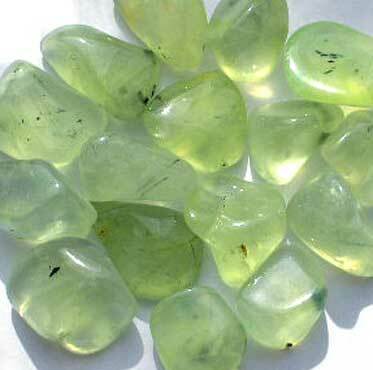 Prehnite, another golden green stone, can be used for various purposes. This stone is associated with the archangel Raphael, it is a stone of unconditional love and it helps to achieve the highest good by connecting the will and the heart. Due to its mineral make-up, the stone works well for divination and prophesy as it helps us to connect and communicate with spirits and other unseen entities through meditation, visualization or out-of-body travel. Moreover it increases our divination abilities and the accuracy of predictions (especially with regards to your own personal growth). Through attunement to divine energy, spiritual growth can be achieved and inner knowledge enhanced in order to prepare for future events. Thus the stone helps to bring about insights, it strengthens your intuition and allows you to accept and recognize the reality and the truth. As a stone of vision, Prehnite is used in meditation to stimulate the third eye chakra and to achieve higher levels of consciousness. In fact, it is considered the perfect stone for meditation because it also brings balance to the heart chakra, with which it is associated. The whiter the stone, the more it works on the higher chakra. Prehnite is a powerful dream stone and helps to remember dreams. Furthermore, as a very protective stone, it can protect you on all levels by creating a strong field of energy around you and so enhance the aura. It is a stone which increases and stimulates energy (including our protective fields) and strengthens the life force. Finally, the stone also works well with regards to the mind and intelligence. Concerning its physical healing properties, Prehnite is used to find the root cause of an illness. It detoxifies the body, stimulates renewal processes that take place in the body and it is helpful in the healing of gout, the kidneys and the bladder, anemia and other blood-related disorders, the thymus gland (because of its effect on the heart chakra), the shoulders, the chest and the lungs. Because of its calming property, the stone is also often used for those who have any type of hyperactivity, such as ADDor ADHD, and it helps in alleviating fears, phobias and nightmares. In Feng Shui, Prehnite (as it enables us to ‘let go’) is used as a decluttering stone anywhere balance or cleansing is needed. In the centre area, it can be employed for grounding, balance, protection and good health as well as spirituality. The stone should be held under lukewarm running water in order to decharge it and it should be left among clear crystal quartz and rose quartz to be charged again. As we have seen, Prehnite is a stone with many qualities whether we refer to the physical, the emotional or the spiritual level.